NEW YORK, 22 December 2015—Sotheby’s set a new world auction record for any piece of Judaica today in New York, when one of the finest copies of Daniel Bomberg’s Babylonian Talmud sold for $9.3 million (estimate $5/7 million, above). 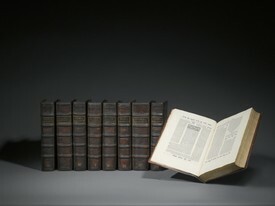 * The extraordinary volume was purchased by Stephan Loewentheil for the 19th Century Rare Book & Photograph Shop. The Bomberg Talmud led the sale of a selection of extraordinary items from The Valmadonna Trust, which totaled $14.9 million and became the most valuable auction of Judaica ever held. ** Together with the auctions of Important Judaica and Israeli & International Art, Sotheby’s annual December sales of Judaica and Israeli Art totaled $22.6 million. The Talmud, or “Oral Law,” is a compendium of hundreds of years of rabbinical discussion and debate which expound upon the laws of the Bible. Daniel Bomberg is responsible for the first complete edition of the Babylonian Talmud (1519-1523), universally recognized not simply as one of the most significant books in the history of Hebrew printing, but as one of the great books of the Western world. The record setting Talmud sold today is one of the finest copies of Bomberg’s edition- of which only 14 complete 16th century sets survive. The Valmadonna Library’s copy of the Bomberg Talmud was kept for centuries in the library of Westminster Abbey. In 1956, collector Jack Lunzer attended an exhibition at The Victoria and Albert Museum celebrating 300 years of Jewish resettlement in England. It was there that he first became aware of the Abbey’s magnificent and complete copy, and vowed somehow to acquire it. He spent the next 25 years determined to fulfill this virtually impossible ambition. Eventually, he purchased a 900-year-old copy of the Abbey’s original Charter, and presented it, along with supporting endowments, to the Abbey in exchange for its copy of the Bomberg Talmud. A further highlight of today’s auction of 12 items from the Valmadonna Trust Library is a Hebrew Bible printed in England in 1189, which sold for $3.6 million (estimate $2/4 million, left). Known as the Codex Valmadonna I, this extraordinary book is the only dated Hebrew text that survives from Medieval England, before King Edward I’s 1290 edict expelling the Jews. Also leading the sale was a Illuminated Hebrew Bible: Psalms, with commentary by David Kimhi, which achieved $670,000 (estimate $300/500,000). The Various-Owners auction of Judaica totaled $4.4 million, and was led by Isidor Kaufmann’s rare painting Interior of the Holleschau Synagogue, which sold for $466,000 (estimate $80/120,000, below right). The painting came from the family of Paul Grüninger, a Swiss police commander in St. Gallen who saved some 3600 Jewish refugees from Austria, following the Anschluss. The auction also featured the only known illustrated manuscript Haggadah from India, which soared above its high estimate to sell for $418,000 (est. $175/225,000). The silver portion of the auction was led by a French silver synagogue eternal lamp, which was created by Maurice Mayer in Paris circa 1855 and sold for $30,000 (estimate $20/30,000). Sotheby’s auction of Israeli & International Art on 17 December brought the strong total of $3.3 million, well within its pre-sale estimate. The sale was led by Reuven Rubin’s 1924 painting The Road to Meron, which sold for $634,000 (estimate $400/600,000, left). Twelve works spanning the entirety of Rubin’s career found buyers, for a combined total of $1.6 million. A further highlight of the sale was one of Mordechai Ardon’s most celebrated paintings, The Venus of Beersheba, which sold for $598,000 (estimate $450/650,000), and Pinchas Litvinovsky’s White Horse, which soared above its high estimate to $125,000 (estimate $60/80,000). Sotheby’s is the only international auction house to offer regular sales of Judaica, which it holds every December in New York alongside the annual Israeli & International Art auctions. Sotheby’s has been entrusted with the most significant collections in this field - including The Michael & Judy Steinhardt Judaica Collection, Property from the Collection of Michael and Doris Zagayski, A Collection from the Sassoon Family Estate, and Important Hebrew Manuscripts from the Montefiore Endowment- and has generated record prices for many significant objects ranging from Hebrew manuscripts to ceremonial objects and textiles. * The previous record total for any Judaica Auction was achieved at Sotheby’s New York in 2013, when The Michael & Judy Steinhardt Judaica Collection brought $8,541,645. Image: The Complete Babylonian Talmud, Printed by Daniel Bomberg in Venice, Comprising tractates from the First (1519/20-1523) and Second (1525-1539) Editions. Est. $5/7 million. Sold for $9,322,000.